Okay, I know Halloween was three weeks ago at this point, and they’re already showing Christmas adverts on TV, but it’s been a busy few weeks and I’ve got catching up to do. Over the last couple of months I’ve taken Isadora Moon as far west as Hereford, as far north as Manchester and south right down to Truro. I’ve visited five Waterstones shops, four literary festivals, and one country estate! It’s been absolutely wonderful working alongside so many people who are passionate about reading, and, of course, meeting so many children who have enjoyed the Isadora Moon stories. I am extremely grateful to Oxford University Press for organising and supporting me with all of these events. Still, after a little break in Cornwall, it’s good to be home for a while. I’m now back in my studio and working on Isadora Moon Goes to the Fair. 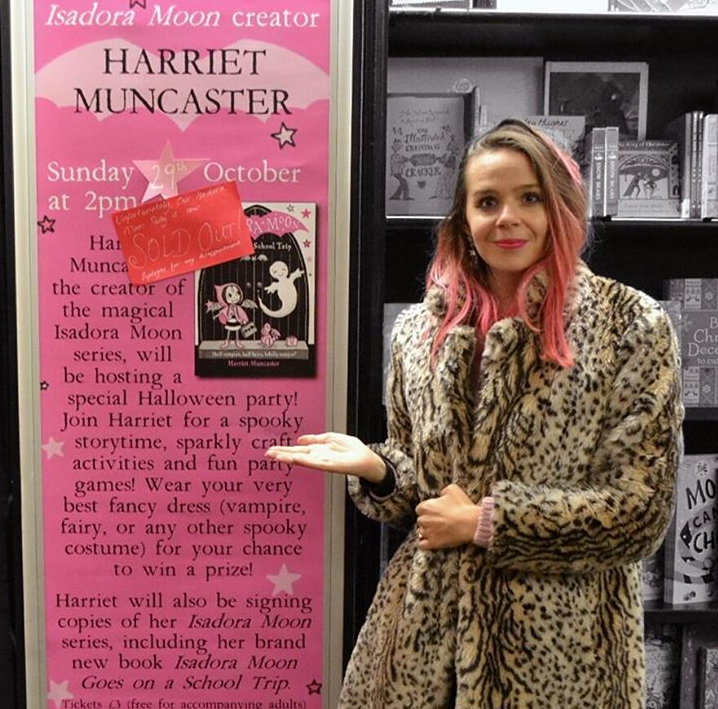 On the Sunday before Halloween I was delighted to be invited to take part in an Isadora Moon Halloween party at Waterstones Manchester. This is the largest Waterstones store in the north of England and has a special separate room for events. Kimi from the children’s department of Waterstones Deansgate had put a lot of work into decorating the room and getting it all ready. She also made sure I had everything I needed both at the party and at our school visit the next day. You can read her book blog here. The party soon got into full swing. The party was ticketed and started at 2pm, so the children all arrived fairly promptly. The room suddenly became very busy with children doing crafts at the tables. Celestine helped supervise the crafting. I brought along my Isadora’s Kitchen 3D illustration, which was popular with some of the children. Isadora Moon’s kitchen scene drew some attention. It’s not a proper party if you don’t sit down to learn something! And we played pass the parcel. The prize was an Isadora Moon book… who’d have guessed? A lot of the children had dressed up for the party. One girl had on a starry, sparkly tutu which I just had to get a photo of. I wish I could get one in adult size! I loved this sparkly tutu. Another girl had put together this custom Isadora Moon tiara. This was based on a .pdf printable created by the book shop and recommendation site Boolino. Here’s a custom-made version of a downloadable Isadora Moon crownSpeaking of the girl wearing this tiara, she actually helps her mum write a children’s book blog. They did a lovely review of Isadora Moon, which you can read here. As Manchester is nearly four hours from us, we stayed the night. Waterstones had arranged for me to visit nearby Broadoak Primary School the next morning. We created our own hybrid character. The children asked lots of questions. Some of the children tried to guess Isadora’s favourite possessions with their eyes closed. Kimi, in the pink t-shirt, helped organised and facilitate the party and the school visit. It was a lovely school and they made me feel very welcome. I’m grateful to Broadoak Primary School for hosting me, and to Kimi at Waterstones for making both the party and school visit so successful. In the run-up to Halloween, I ran a little costume competition. I wasn’t sure how many entries I would get, but I wasn’t disappointed! There were some absolutely amazing Isadora Moon costumes from a few different countries. Thank you so much to everyone who took the time to make a stunning Isadora costume and share their pictures on social media. I’ve already shared this montage of some of the costumes I’ve seen in the last month, but it’s worth sharing again. Quite a few people really put a lot of time and effort into sharing the spirit of an Isadora Moon-themed Halloween! Judging a winner was really difficult, so I enlisted Henry to help. We debated for a good half an hour about how to choose an overall ‘winner’ for the purpose of prizes. Left to right: I love this girl’s spooky vampire wings and make-up; this girl has such a cut expression, and a great bat-topped wand and crown; this girl nailed the pink-and-black look and has fantastic home-made wings. This girl found the PERFECT Isadora Moon dress: the collar is just like what Isadora wears on the Isadora Moon Goes to School cover! I met this girl at the Manchester Waterstones party, and I’ve linked to her blog above. She really paid attention to detail, with the custom ‘Boolino’ crown, stripy-eared Pink Rabbit and bat pin. This girl got the pink dress, stripy tights and bat wings, but what really impressed me was the pointy ears and Isadora hairstyle. As I said, it was really difficult picking an overall winner. When we looked at how many different aspects of Isadora Moon Faith’s costume covered, we knew she had to be the winner. Firstly, the dress with its almost-tutu is just the sort of thing Isadora Moon would wear for her fairy side, while the black cape shows off her vampire side. Of course, Faith has the stripy tights and half-fairy, half-bat wings. She’s got a Pink Rabbit too. What she’s also got is the pointy ears, fangs and Isadora’s trademark mussed-up fairy hair. Well done! I did suggest in the competition that I would be extra-impressed if any families dressed up as Isadora’s family, not really expecting any to. Amazingly, there were actually three families who donned pink and black vampire fairy outfits! The Botella family from Texas transformed themselves into the Moon family for Halloween. Is that Oscar the ghost in the background? The little girl of the family, Luna, also made this very creative and fluffy Pink Rabbit squash. The Staple family from Belfast also transformed themselves into Bartholomew, Cordelia, Isadora and Honeyblossom Moon! The third Isadora Moon Halloween family was the Francz-Kna family from Budapest, Hungary. The light-up tiara is a nice touch! I love that Honeyblossom even has some pink milk! Here you can see how closely they stuck to Bartholomew and Cordelia’s character designs. I love the way that each family clearly put lots of care and energy into creating their costumes together. All three have a signed Isadora book on its way to them in the post.